1) What if my artist submission is selected to perform at FMF2018? * Complimentary ARTIST Conference Passes for each member of the band: This pass allows you access to all Industry Conference Panels and Artist Networking Events. 2) What if my artist submission is NOT selected to perform at FMF2018? * Complimentary ARTIST Conference & Showcase Passes for all members of the band: This pass allows you access to all Industry Conference Panels, Showcases and Artist Networking Events. 3) How do I Register for additional conference passes and/or showcase wristbands? All Conference Registration information Artist, Student and Industry Advance Registration will be available March 23rd, 2018! 4) When are the showcases? Artist showcases run from about 7pm-2am Thursday through Saturday. All showcasing artists play a 30-minute slot. 5) How long are the showcase? All showcases are 30 minutes long. Backline is not provided, but high quality showcase venues with all necessary sound equipment and technical assistance will be available. 7) When are the Industry Conferences? All Industry Conference Panels are held on Saturday, May 12th. 8) Will my artist or representative be able to meet and network with the Industry Attendees? Yes, all submitting artists will receive Conference Passes(see above for quantity), in which all Industry Attendees, including Keynote Speakers like Kevin Lyma (Founder of the Warped Tour), Melvin Benn (Founder of Festival Republic), Monte & Avery Lipman(Founders of Universal Republic Records), John Janick (Founder of Fueled By Ramen / CEO Interscope Records), Steve Robertson(VP of A&R Atlantic Records), Rodney Jerkins(Producer: Beyonce/Michael Jackson/Kanye West), are made accessible for you to meet, network and hand them demos or business cards. 9) What if I have more questions about my artist, the submission process or FMF2018 in general? Please contact artistrelations@floridamusicfestival.com with any questions. Registration Area is at Ace Cafe at 100 W Livingston St in Downtown Orlando. Advance Discount Registration is available by clicking FMF2018 INDUSTRY REGISTRATION. Walk Up Registration is available at the FMF2018 Headquarters Thur-Sat between 10am-6pm with the Student Discount Advance Rate of $50, and Industry Rate of $75 until May 10th, and the standard Industry rate of $100 walk up, with $75 for Student/Artist Discount Rate. 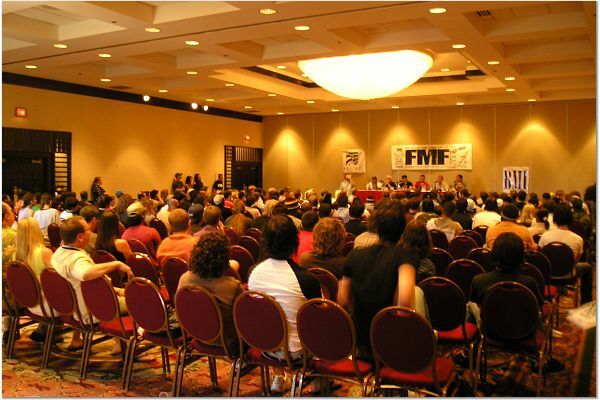 Your registration will obtain access to all Industry Events, VIP Parties & Showcases throughout FMF2018! 4) Do I need to be employed at a Music Company to register for an INDUSTRY PASS? You do not have to be employed or affiliated with a national company or major label in order to register for an Industry Pass. This is an opportunity for everyone to register for access to network with all national, regional and local music industry players. The event is designed for the aspiring industry professionals and music business students to interact with some of the most successful people in the music business today. Whether you are promoting a band, a company or just trying to get your foot in the door at one of their companies, the Florida Music Festival offers all those opportunities. 5) What’s the difference between an INDUSTRY and an ARTIST PASS? 6) What do I need to register for the STUDENT Discount? Please write in your present University or College and the degree or program you are seeking. This will help us in also providing you with relevant information for your FMF experience. Register for FMF2018 STUDENT REGISTRATION. 7) What if I need more info or do not want to us an online registration form? 1) How and where do I get a 1 DAY pass that allows me access to all venues that night, or throughout the Festival? • All the Venues are FREE! Yes, all participating venues are FREE! Venue capacity limitations and age restrictions apply. Most venues are 21andUp. 2) Where can I find a schedule for all of the Showcases, Conferences and Headliners? • Check out the Showcase Schedule here on March 23rd! 3) What is the age requirement for shows?